Scientists at the Massachusetts Eye and Ear and Schepens Eye Research Institute say they have found an association between a defective myogenic response (the regulatory increase or decrease in blood pressure to keep blood flow within the vessels of the retina constant) and early, accelerated development of retinopathy in patients with type 1 diabetes. These findings (“Defective Myogenic Response of Retinal Vessels Is Associated With Accelerated Onset of Retinopathy in Type 1 Diabetic Individuals”), published in Investigative Ophthalmology and Visual Science, identify one mechanism to explain why some patients develop diabetic retinopathy sooner than others. Furthermore, the research provides a target for future study, which may lead to therapies to delay or prevent the development of accelerated onset diabetic retinopathy. The study included a small prospective study, in which the researchers closely followed 17 patients with type 1 diabetes whose myogenic responses had been measured 4 years prior. In approximately half of those patients, the researchers had observed defective myogenic responses. Five out of seven patients with defective myogenic responses developed accelerated diabetic retinopathy. The study also included a different group of patients with type 1 diabetes who had just developed retinopathy. Among these patients, the defective myogenic response was found only in those in whom retinopathy had appeared after a short duration of diabetes (fewer than 15 years of diabetes). The most common diabetic eye disease and a leading cause of blindness in American adults, diabetic retinopathy occurs when blood vessels in the retina become damaged and leak fluid. Accumulation of fluid into the retina can lead to macular edema. As the damage due to diabetes progresses, the vessels become occluded and can no longer carry blood. New blood vessels grow on the surface of the retina (proliferative retinopathy); but the new vessels are immature and may rupture and impair vision. 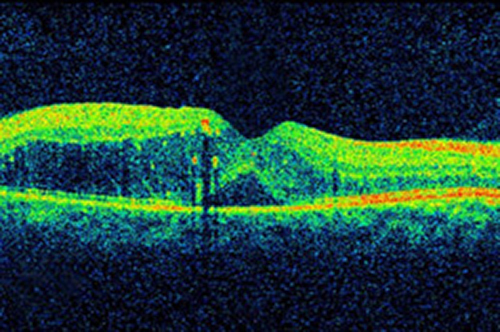 Loss of visual acuity as a result of diabetic retinopathy is often the first warning sign for patients yet to be diagnosed with type 2 diabetes. Currently, there are no treatments for diabetic retinopathy beyond controlling blood sugar and blood pressure levels. The new vessels of proliferative retinopathy can be treated with laser techniques, often at the expense of a portion of the retina. With the knowledge gained from the new studies, the researchers hope to target the defective myogenic response and develop therapies to prevent the development of accelerated diabetic retinopathy in this population. A larger study is needed to test the predictive capability of this abnormality. “Now, we have a target to be investigated for the development of drugs or interventions to halt or stall the onset of clinical retinopathy,” Dr. Lorenzi said.